On the other hand, just because you have visions of cobbles, and self-torture after watching a rainy version of one of the spring classics doesn’t mean you should go out and try to re-enact scenes in your head by riding in the rain… This is where it starts to get silly. You are not Sean Kelly, you do not have a contract; you are not contractually obligated to ride in the rain. Heck, you may not even have the gear or talent to maneuver well enough in the slop that the roads are slathered with during a shower. Your petty dreams of Belgian cobbles are a fantasy in WV, and keep it at that, otherwise you will be placed on my crazy people list. Okay, so you are kitted up and have your layers on or whatnot. You think you are prepared for the WV roads ahead of you just because you have your cycling cap on, and a pair of knee warmers. What about the grit, the loss of grip on the road? Do you know how to properly thermoregulate while on the bike? Handling? How does your bike change when the roads are muddy, or just overall slick? Are these things you have encountered before, or are you just going out willy nilly; with all concerns being thrown to the wind? If you haven’t done this before, start slow. Don’t pump your tires up before the ride; keep them about 10psi lower than usual. Cut the ride length by about 20-30% for a first rain ride. Bring a spare tube and co2, and please….. Please tell me you know how to change a tube, and won’t whine about changing it in the rain. I’m already waiting for you to start pedaling again; I don’t really want to hear you complain. If I wanted that, I could have just stayed home and listen to the family complain about the noise my trainer makes. Also, if you are a newbie rain rider, be sure not to crash into me on the downhills. Prep your brakes before you actually plan to brake by tapping them a few times first. This gets some of the water and muck off the machined lip of the rim, and makes braking a little more effective. Lastly, if you didn’t bring a splashguard, or fenders, stay far enough away from me that I don’t have to be sprayed in the face continuously by the water coming off of your back wheel. The skills of riding in the rain are pretty common sense, and most people with an IQ level higher than the number of teeth on their outer chainring catch on pretty fast. Just don’t be afraid to slow down if you need to. Better to get home safe, than to have to call for a ride to get back. Bikes – They’re tools, not jewels. You should still maintain them like they are a Smithsonian-quality artifact, but don’t be afraid to ride it like you stole it. Pros don’t do a thing with their bikes after they cross the finish line. On the other hand, you do, and will have to be prepared to inspect and clean things appropriately. 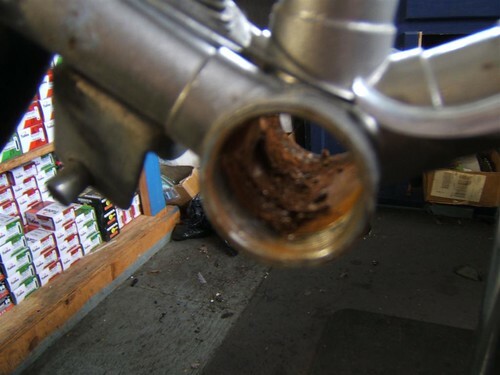 Make sure rain isn’t going into your seat tube, clean your chain, and get the grime off your drivetrain/pedals, and make sure all of the pivoting parts on the bike are in good shape. If for some awful reason you are riding a steel bike… make sure to bring it inside post-ride. Rust is a terrible thing. Trust me. Better yet, take your rain bike/cross bike out instead of your main steed. You do have more than one road bike, right? What are the benefits of riding in the rain? Any? The novelty of it is pretty exciting, but once that wears off, what is left? The acquisition of superior bike handling may be the only key element that can be gained from such training. Falling or getting sick due to the weather are the main negative consequences, and the prior is more of an eventuality than a potential consequence. Falling happens, you just have to be ready for it, or be lucky enough to catch yourself. Even with the threat of looking crazy, having to prepare a bit more, and chances of getting hurt, there aren’t really any alternatives to riding in the rain. Stationary trainers are just about the most unmotivating thing you can do. I think I would rather not ride than ride a trainer. Seriously. As long as it isn’t too cold or intense, get out there and ride in the rain. Keep your awareness up, and enjoy the ride. Stay warm, ride hard, and enjoy being outside.